Hakimpet is located roughly 25km north of the twin cities of Hyderabad and Secunderabad in Andhra Pradesh. 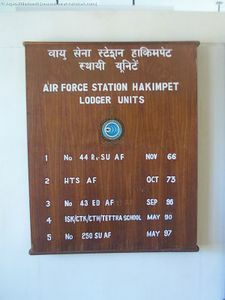 An airfield whose history goes back to the beginning of the Second World War, Hakimpet entered the OrBAT of the Indian Air Force in 1951, when the Conversion and Training Unit was established to provided Fighter Conversion Training to freshly commissioned pilots in the IAF. 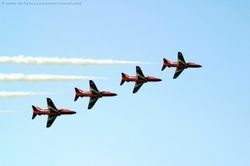 The years that followed saw the establishment of the Jet Training Wing and its subsequent renaming to Fighter Training Wing. 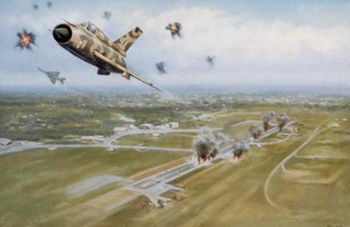 In Dec 84, this airfield was upgraded to a full fledged 'Air Force Station' status. Today it houses the FTW, the Helicopter Training School and ancillary units. With a history that stretches back 53 years, the Station operates a moderate sized 'Museum' which was established in 2001. Though till recently, the historical component was minimal, the last year and a half saw some significant improvements and quite an amount of historical photographs and data is on display. 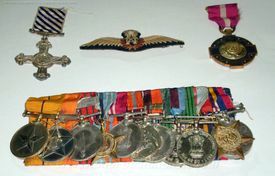 This work was undertaken by the then AOC Air Commodore Rakesh Kacker. In addition to the photographs of most of the COs and AOCs, the Museum has mannequins on display showing the various Air Force Uniforms. 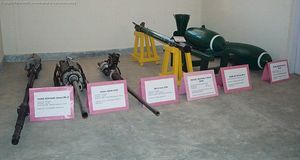 A weapons gallery that has examples of the Aden, DEFA, Gasha Cannon as well as fighter ordnance, including rockets and a 500lb bomb. As with other museums, there is a lone aircraft that 'guards' the museum. Fittingly it is a De Havilland Vampire FB52, painted with the false serial 'FTW-1971'. It is assumed that this aircraft was installed here about the same time the Vampires were phased out. 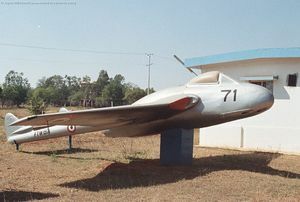 The real identity of this aircraft was revealed when this Vampire was 'restored' by the local R and SU. 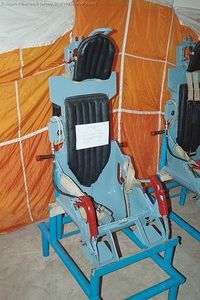 painted inside the cockpit was the serial IB-1618. 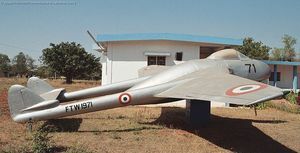 A dataplate on the port wing revealed its date of manufacture to be late 50s and that it has been built by HAL. The Hakimpet Museum and "Motivation Hall" welcomes the visitor as soon as he enters the station. 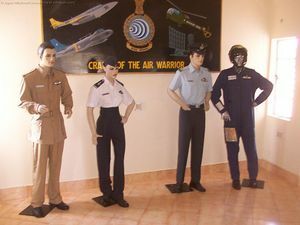 Mannequins at the entrance in various uniforms and Flying gear. 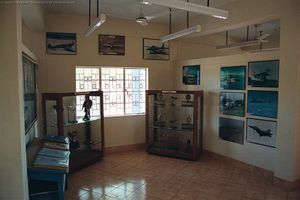 Most of the Galleries have photographs of current aircraft in service and also of aircraft from the Vintage Flight. 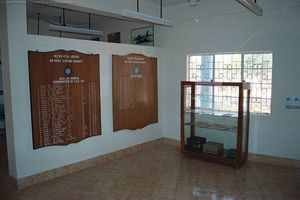 The Museum however have numerous data boards that give various details of commendations won by the Hakimpet Air Force Station personnel. 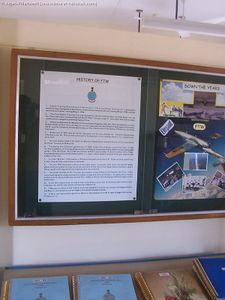 This display board gives the history of the Fighter Training Wing. 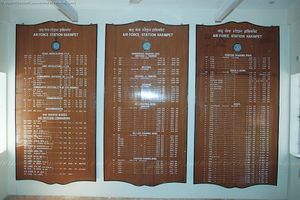 These three boards give details of the COs and AOCs and the dates in which they held command. Also given are details of each and every course that passed thru the portals of Hakimpet. 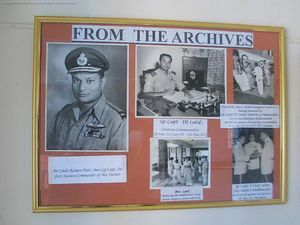 A welcome addition to the Museum are a number of vintage photographs dating back to the 50s. 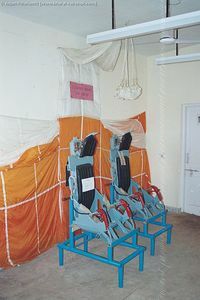 Two Ejection seat and a parachute taken from one of the unserviceable Iskras form the other end of the museum.